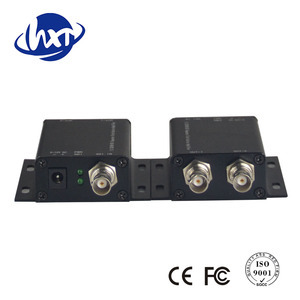 SDI 1 Input 2 Iutput Audio Splitter #SSP0102A10 1x2 SDI Splitter, SSP0102A10, distributes one SD/HD/3G-SDI source to two SD/HD/3G-SDI displays. 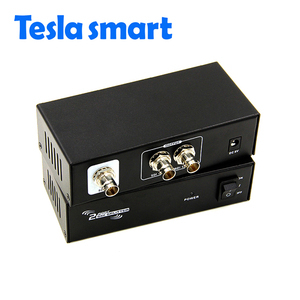 Without delay, built-in automatic format detection of SD-SDI, HD-SDI, 3G-SDI. Features 1. Distributes 1 SD/HD/3G-SDI to 2 SD/HD/3G-SDI displays. 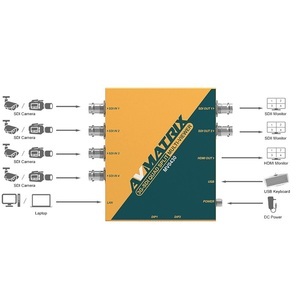 2 Channels IP ASI to SDI out HD/SD Decoder Technical Indicators Input 2 IP (MPTS/SPTS) (1000Mbps/100M Ethernet) (RJ45) IP input over UDP protocol (Unicast/multicast) 2* ASI bi-direction, BNC 75&Omega; Decode Video Format MPEG-2/H. 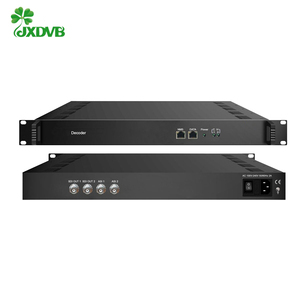 cn Tel/WhatsApp: +86-18683422509 Advantages * 2*IP and 2*ASI input * 2*HD/SD-SDI decoding out, 2*ASI TS out and 1 IP output * MPEG-2 and MPEG-4 AVC/H. 264 Decoding for video * MPEG1 Layer2, LC-AAC, HE-AAC, AC3 (2.0/5.1), AC3 Passthrough for audio * Support Dual Audio Out * Support CC/Subtitle * High reliability design, stable performance * Easy manage with web-server remote control Product Show 2* IP/2*ASI &rarr; 2*SDI output/2*ASI output/1 IP output --- MPEG-2, H.
With this device, you can output two HD-SDI signals, each with a separate video chip, which provides stable signal distribution and sharp video images. SD/HD/3G-SDI 1:2 SDI repeater with SDI line equalizer, RECLOCK and line driver supporting SMPTE-252M SD-SDI, SMPTE-292M HD-SDI, SMPTE-424M 3G-SDI meets all SMPT standards and meets broadcast television transmission standards. 2. features n Support standard definition SDI (270Mbps), HD-SDI (1.485Gbps) and Full HD 3G-SDI (2.97Gbps) video format; n Maximum cable length (Belden-B1694): SD support 400m, HD support 200m,,3G support 140m; n S upport SMPTE 292M, SMPTE 259M , SMPTE 424M n with two independent buffered outputs n Built-in cable equalizer Equilizer, clock regeneration circuit Reclocker and cable driver Cable Driver; n With power and SDI signal format indication, user-friendly real-time monitoring; 3 . 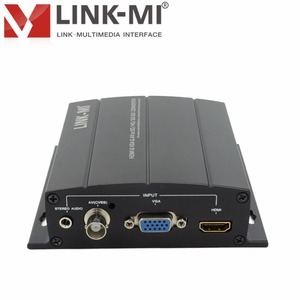 LM-SC5325 2 Channel SDI out HDMI/VGA/AV to 3G SDI Video Converter Model:LM-SC5325 Color:Black Size:158x120x36mm Keyword:SDI Video Converter LM-SC5325 SDI Video Converter LM-SC5325 SDI Video Converter convert a single channel HDMI signals or VGA signals or AV(CVBS) signal to SDI/HD SDI/3G SDI signals. 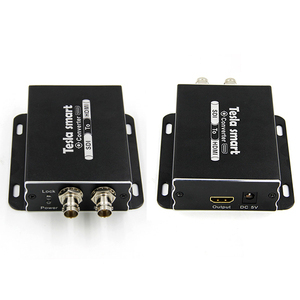 Simultaneously, it also Integrates and converts the audio signals of CABS or VGA, then embed it to SDI signal. 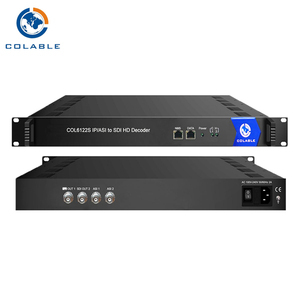 This SDI Converter is mainly used in the following situations: HD video multimedia information publishing system in subway platform; HD video multimedia information publishing system in train station; Military exercises of HD video signal; Security monitoring of high definition video signal; Large performance high clear video signal transmission; All kinds of high definition video should be occasions, etc. User can also adjust the size and position of 11-character UMD and audio meter overlay freely. Similarly, the size and position of the 2&ndash;channel audio metering can also be user-defined. Meanwhile, SDI Quad Screen Multiviewer scaler also can be remote set by using a software by connecting it with a PC via LAN. 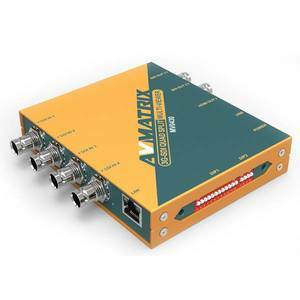 Features 1.Supports 2 SDI input signal switch to 1 HD SDI monitor. 3 Connect the power adapter between SDI Switcher and outlet. 4 Open the power supply of SDI signal source and the display. The format of the output can realize pass through or up/down scaling, frame rate conversion and de-interlacing function. And the format of output can realize pass through or up/down scaling, frame rate conversion and de-interlacing function. Meanwhile, it also can be remote set by using a software by connecting it with a PC via USB. Summary The encoder (with CVBS input) is a professional SD audio & video encoding and multiplexing device with powerful functionality. 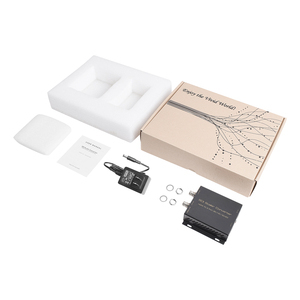 This device can simultaneously encode 4 channel SD audio & video; moreover, it has an ASI input and can multiplex the input TS with the 4 encoded SPTS to generate a MPTS output. 264 and MPEG-2 video encoding, advanced video pretreatment algorithm 4.MPEG1 Audio Layer 2,LC-AAC,HE-AAC 5.Supports VBR/CBR video encoding 6.Supports ultra low bit rate encodings: 0.25~15Mbps(H.
Alibaba.com offers 7,928 2 sdi products. About 43% of these are radio & tv broadcasting equipment, 8% are fiber optic equipment, and 5% are other home audio & video equipment. A wide variety of 2 sdi options are available to you, such as indoor, outdoor. You can also choose from full color, green. As well as from video, graphics. And whether 2 sdi is insulated, bnc, or video conference system. There are 7,928 2 sdi suppliers, mainly located in Asia. The top supplying country is China (Mainland), which supply 100% of 2 sdi respectively.  sdi products are most popular in North America, Domestic Market, and Western Europe. You can ensure product safety by selecting from certified suppliers, including 1,467 with ISO9001, 1,183 with Other, and 142 with ISO14001 certification.